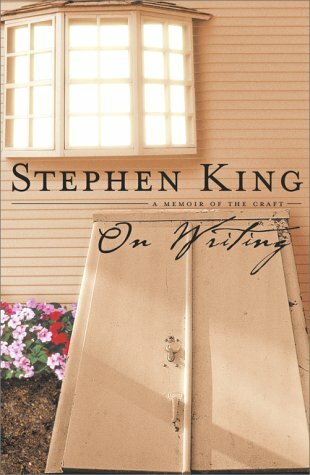 The author of The Stand, The Shining, and other great books shares his insights into the craft of writing, offering a breezy, humorous perspective on his own experience as a writer. 500,000 first printing. BOMC Main. QPB Alt. Short and snappy as it is, Stephen King's On Writing really contains two books: a fondly sardonic autobiography and a tough-love lesson for aspiring novelists. The memoir is terrific stuff, a vivid description of how a writer grew out of a misbehaving kid. You're right there with the young author as he's tormented by poison ivy, gas-passing babysitters, uptight schoolmarms, and a laundry job nastier than Jack London's. It's a ripping yarn that casts a sharp light on his fiction. This was a child who dug Yvette Vickers from Attack of the Giant Leeches, not Sandra Dee. "I wanted monsters that ate whole cities, radioactive corpses that came out of the ocean and ate surfers, and girls in black bras who looked like trailer trash." But massive reading on all literary levels was a craving just as crucial, and soon King was the published author of "I Was a Teen-Age Graverobber." As a young adult raising a family in a trailer, King started a story inspired by his stint as a janitor cleaning a high-school girls locker room. He crumpled it up, but his writer wife retrieved it from the trash, and using her advice about the girl milieu and his own memories of two reviled teenage classmates who died young, he came up with Carrie. King gives us lots of revelations about his life and work. The kidnapper character in Misery, the mind-possessing monsters in The Tommyknockers, and the haunting of the blocked writer in The Shining symbolized his cocaine and booze addiction (overcome thanks to his wife's intervention, which he describes). "There's one novel, Cujo, that I barely remember writing." King also evokes his college days and his recovery from the van crash that nearly killed him, but the focus is always on what it all means to the craft. He gives you a whole writer's "tool kit": a reading list, writing assignments, a corrected story, and nuts-and-bolts advice on dollars and cents, plot and character, the basic building block of the paragraph, and literary models. He shows what you can learn from H.P. Lovecraft's arcane vocabulary, Hemingway's leanness, Grisham's authenticity, Richard Dooling's artful obscenity, Jonathan Kellerman's sentence fragments. He explains why Hart's War is a great story marred by a tin ear for dialogue, and how Elmore Leonard's Be Cool could be the antidote.